Abdominoplasty or tummy tuck is an operation that elevates, redrapes and tightens the abdomen and waist. Excess skin is removed via an incision hidden within the bikini line and the muscle is tightened resulting in a shaplier figure and flatter stomach. Liposuction especially of the love handles is usually performed at the same time and stretchmarks below the level of the belly button are removed. Some tightening of the thigh and buttock skin is also achieved. In these cases the effects of liposuction, removal of stretchmarks and tightening of thigh skin are readily apparent. These are cases in which patients had excess skin and fat and loose abdominal muscles prior to abdominoplasty surgery. The abdominoplasty – tummy tuck scar is the handle bar shaped scar across the lower abdomen, 2 years after surgery. The vertical scar to the right of the belly button is from previous surgery unrelated to the abdominoplasty. This type of abdominoplasty scar is achievable by strictly following the instructions given after surgery including a regimen of scar taping. 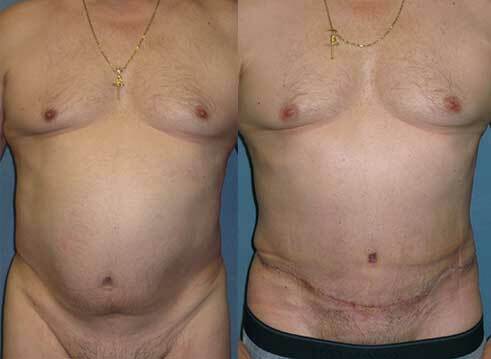 62 year old, 5’10”, 190 pound man before and 38 days after abdominoplasty – tummy tuck with liposuction.